We Were Complacent In Our Campaign Efforts- Lord Commey Some leading members of the ruling NPP have still not gotten over what they call the shock the opposition NDC gave them in the recently held presidential and parliamentary elections. 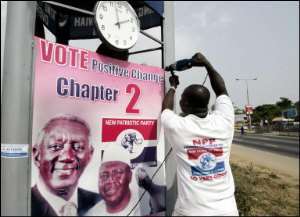 Expectations from the NPP's camp were that the NDC would be battered in the general elections. Contrary to those expectations, the opposition NDC polled 44 percent as against the ruling NPP's 52 percent. What is more worrying to the NPP, is the fact that, the NDC won an additional seat in the NPP's stronghold, Ashanti Region, increasing its 22 percent votes in 2000 to 26 percent. This impressive performance from a party that was considered to be financially weak has drawn comments from leading members of the NPP calling on the party to sit up and start an early campaign for 2008. In a follow up interview with JoyFM News, the National Organiser of the party, Laud Commey, acknowledged the fact that the party was a bit complacent in its campaign efforts. “I think that in the areas we lost in the Ashanti Region are areas that has been our weak areas all this while”, he said. He said he was not surprised at all at the NDC's impressive performance and that it was normal and natural that the Ashanti Region being the stronghold of the NPP was expected to put on a better performance. Lord Commey further stated that it was important for the NPP as a growing party that would want to sustain power to get competent and the right calibre of people to work with. “I do not think that our message got down well with the people in the areas we lost”, he said. According to Mr. Commey the December polls have re-enforced the party's resolve not to underrate the political strength and popularity of the opposition NDC. “We have always acknowledged the fact that the NDC was a force to reckon with and one cannot just underrate them because they form a huge grassroots organisation”, he said. He stated that the 4years of the NPP was an indication of how hard the party and its foot soldiers across the country had worked for victory.